Ah, yes! FBX, the sodding nightmare that just keeps on giving. I just want to get on and do some programming! Is that too much to ask?!? 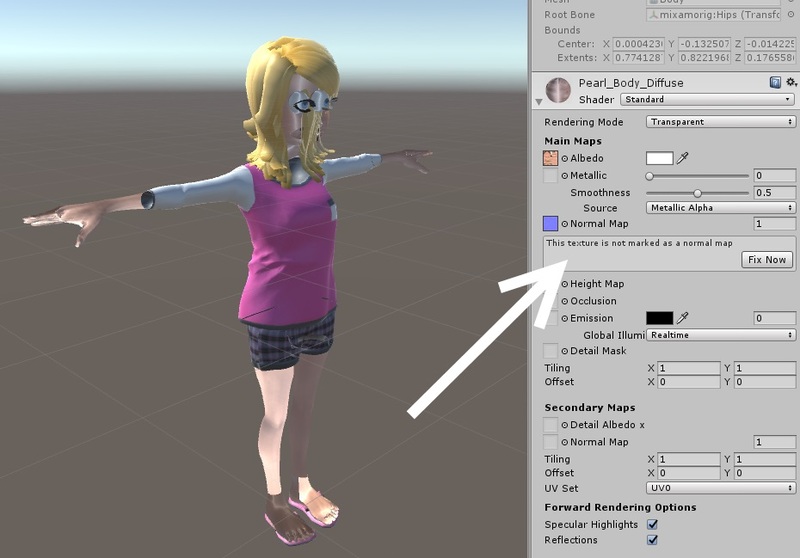 Model source Mixamo’s Pearl.fbx (other formats supported: DAE and BVH). It looks like normals are inverted, clipping is set incorrectly or something similar. Additionally, the normal map texture needs to be marked as such. Fixing that is only a slight improvement. After a bit of research it turns out to be a transparency setting. Nope! It looks inside out. The import shows similar problems Unity. Unfortunately, despite messing around with normals, winding order and transparency in Babylon, I haven’t been able to rescue the model. The Blender exporter really choked on this model. The import looks OK, apart from the missing textures. However, it complained about being unable to export due to an armature. Once the armature was removed, something was exported. I’m not a user of Blender (I’m not a fan of it’s idiosyncratic interface, and dammit! I’m a doctor… er, programmer not an artist) so I called time on this abortive effort. Clara.io doesn’t quite make it. Which is a pity as I really like it. Alas, the foot ‘n’ balls issue persists in the export. FBX is a complex and proprietary format, clearly not all APIs can handle all the variations. We should probably be grateful that we get any import functionality. Ultimately, this is a win. I have at least one viable fall back should PlayCanvas fail. 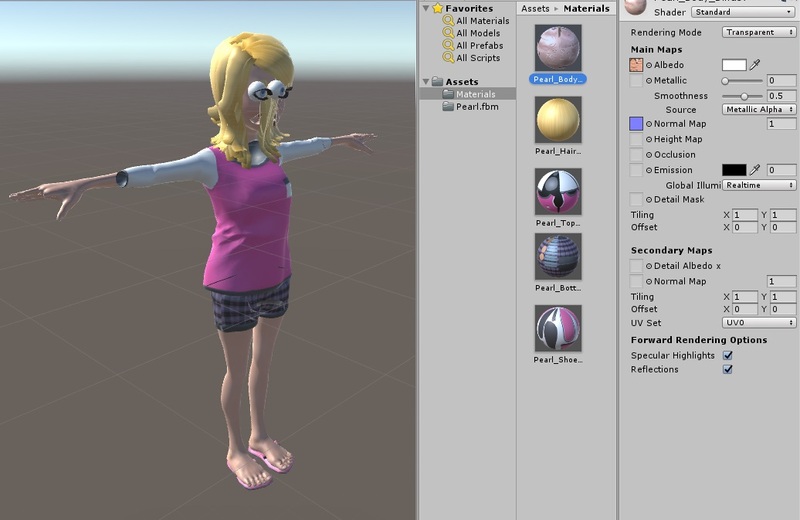 I’m also hoping that the Three.js FBX importer gets the kinks ironed out and comes on line soon. There is further research to be done, e.g. with glTF and JSON formats. This entry was posted in Develop conference, Game development, Game jam, Uncategorized and tagged Develop conference, FBX, Game development, Game jam on June 20, 2017 by Admin. 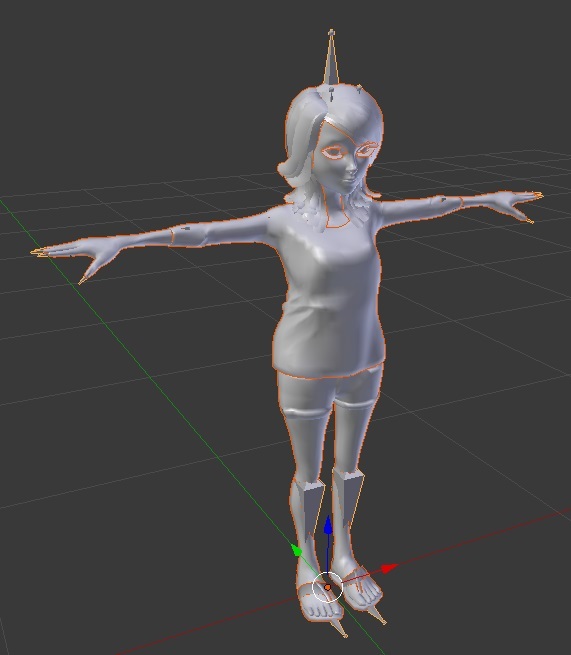 I decided to use the “Pearl” model from Mixamo to experiment with animation and (as it turns out) importing FBX files. 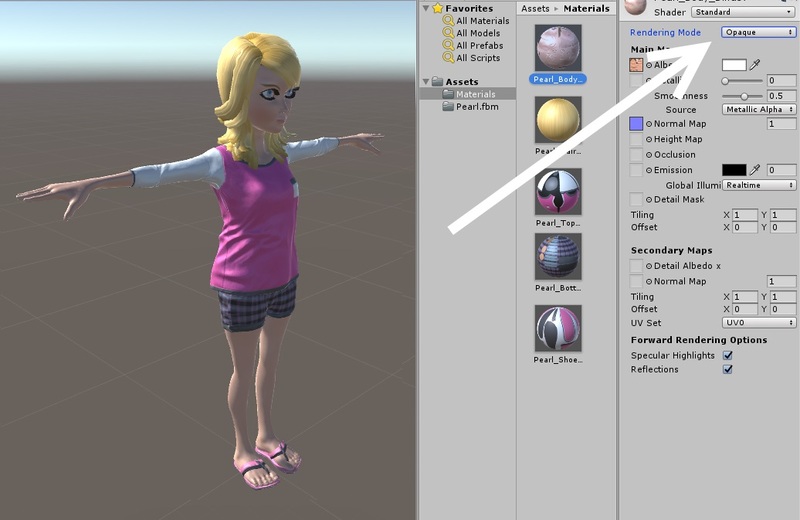 Importing into PlayCanvas is straightforward, simply drag and drop the FBX into the assets area. PlayCanvas converts the file to JSON format with associated textures (in PNG format) and materials. You end up with two JSON files (not sure why) but it’s fairly obvious which is the one to use. The model can now be added to the scene. There were problems with the eyes, they were black and the eyelashes were solid black. Frankly after a long day I was fed up and knocked off for the day, after leaving a request for help on the PlayCanvas forums. After some very helpful suggestions by Steven Yau, I was able to tweak some settings to correct the model. A black specular colour tint fixed the eyes. 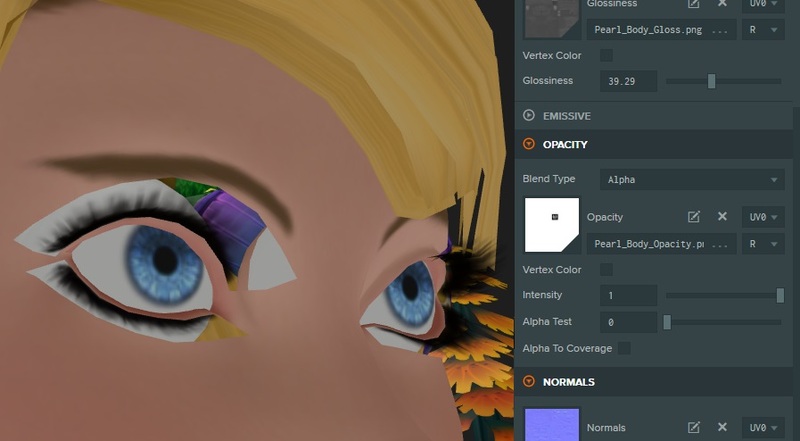 Setting the opacity blend type to alpha fixed the black eyelashes, but caused them to act as a stencil straight through the poor model’s head when viewed from below. Will the horror never end!?! 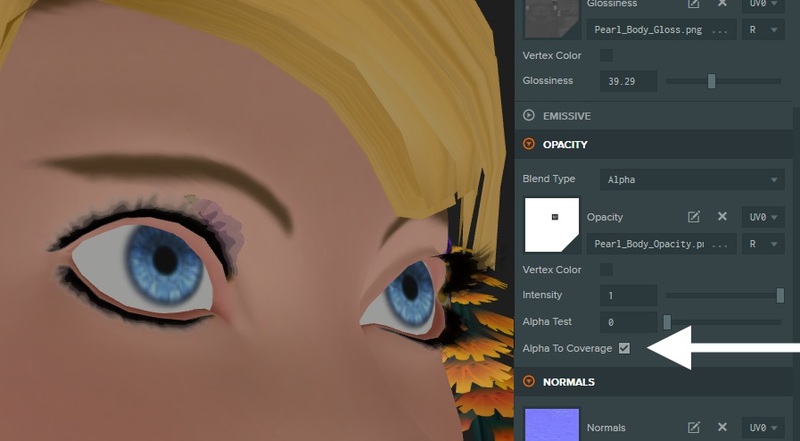 Setting opacity “alpha to coverage” fixed the clipping eye syndrome. This entry was posted in Develop conference, Game development, Game jam, Uncategorized on June 19, 2017 by Admin. In this workshop, we’ll have a look at how to use WebGL to apply special colour effects to our images. This workshop will also be an opportunity to cover the basics of matrices in WebGL and GLSL, and make them easier to approach. The end goal is to build a very simple playground app that will allow you to experiment with image filters on your own. Arrival from 6:15 for a 6:30 start. * A laptop with a browser that supports WebGL (http://get.webgl.org/) and your favourite editor. * A desire to learn. If you’re planning on attending please RSVP (above) and register on the SkillsMatter site (https://skillsmatter.com/meetups/7603-webgl-workshop-december-2015). An introduction to WebGL and shaders (GLSL), for those who have no experience of WebGL. In this session we’ll cover the WebGL basics – set-up, basic interaction and simple animation. The aim is to program a dice the user can “roll” with the mouse. I’ll keep the maths to a minimum (no quaternions, honest). The demo code from the first workshop should provide a good foundation, but there will be plenty of pretty (and hopefully informative) slides available… quite probably on-line “handouts”. being an introduction to those most noteworthy of WebGL enablers — Babylon.js and Three.js wherein we shall endeavour to render a simple electronic Yule Tide scene for each. In keeping with the seasonal theme there will be door prizes (Packt ebooks on the subject of Three.js or WebGL supplied by my good self). The supply of Pizza and certain beverages may also be arranged. And a merry Christmas to one and all. • This is a hands on session. A laptop with a browser that supports WebGL (http://get.webgl.org/) and your favourite editor. This entry was posted in Uncategorized on December 4, 2014 by Admin. Khronos liked the cut of our jib and so now we’re the official Khronos London Chapter. There are no immediate changes in the future, but I hope over time to add coverage of other Khronos technologies; OpenGL, OpenGL ES, OpenCL, etc.. This entry was posted in Uncategorized on October 5, 2014 by Admin. This entry was posted in Uncategorized on June 26, 2014 by Admin.